The first time you have no credits in your credit pool each turn, gain 1credit. There have been several attempts to create a "world church," uniting all human faiths into a single, harmonious whole. The irony, of course, is that each new "world church" is another schism in humanity's shared religious experience. This is one of those cards that prompted a confused "Huh?" response on release. However, with the advent of Spark Agency, this might start seeing some play. As the other review mentions, this works well with Personal Workshop decks, as long as you don't mind floating at or near 0 credits for most of the game. But there are a few problems with this, and they are quite substantial. 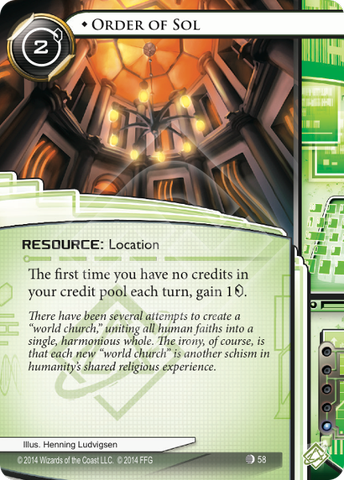 For starters, it is pointless to try and use this with some other terribly useful cards in the current meta, like New Angeles City Hall. Even with burst econ, you usually don't want to stay low in credits, as a wise corp will know you either have that Stimhack in your hand, or you can't contest the server, and they can just install an asset or upgrade in their scoring server to test the waters. If it weren't unique, I could see this being pretty powerful, but as it is, you're probably better off with other drip econ, namely Underworld Contact or even Data Folding. There are just too many other, better options out there, and while Spark Agency is really catching on, I don't think it's enough to warrant inclusion of this in your deck. Order of Sol is an interesting resource, but one of somewhat limited use. The most obvious use is in conjunction with Nasir Meidan, to prevent the run from entirely ending on a Pop-Up Window or Paper Wall. It has good synergy with Personal Workshop, to get hardware and programs hosted on it out in a timely manner. Order of Sol can also be a minor recovery card after getting hit with Closed Accounts. It can even see some minor play in Valencia Estevez when used with Personal Workshop. The bonus is that it is one influence, however for two credits and only one activation per turn, Order of Sol seems quite inadequate for regaining lost credits. The earlier you play it, the more credits you'll make back, especially in Nasir decks. So to sum up: it's best utilized in Nasir or Valencia decks alongside Personal Workshop. As a recovery card it's inadequate compared to some other cards out there, but it definitely shines with Nasir.